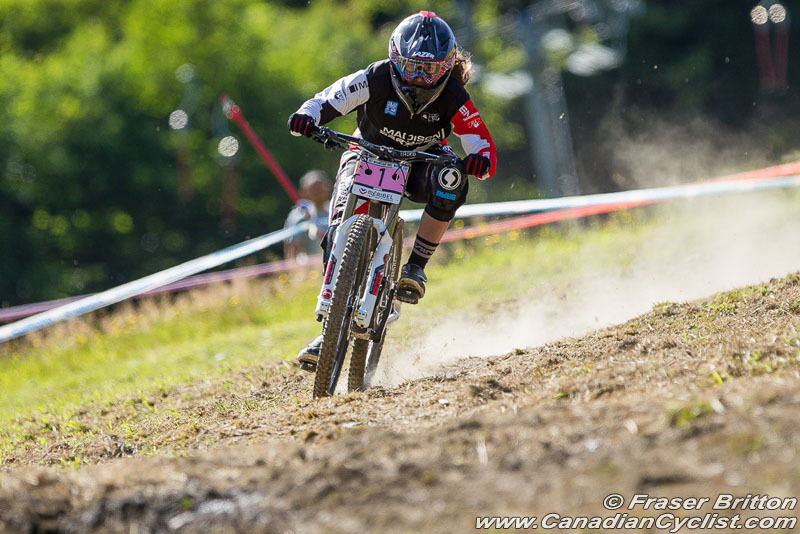 The 2015 season of the UCI Mountain Bike World Cup presented by Shimano opens with Round 1 of the Downhill series, in the new World Cup venue of Lourdes, France. 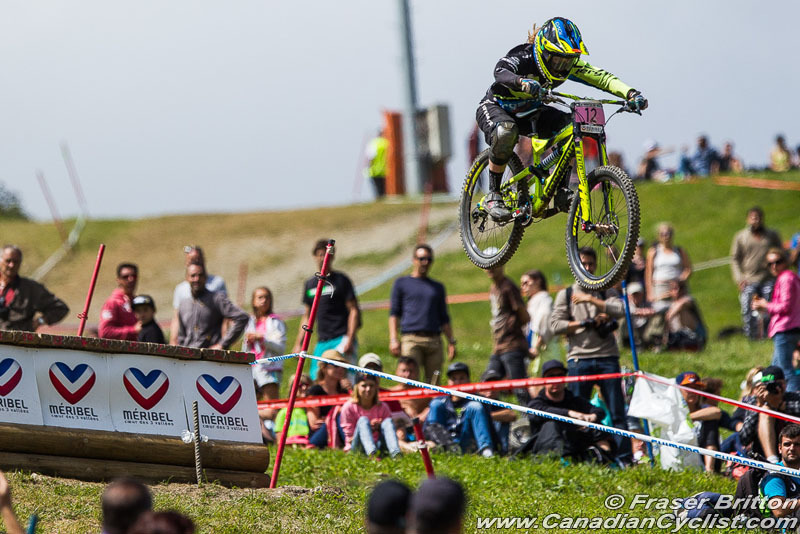 However, while Lourdes is new to the World Cup, it has a strong gravity resume, having hosted French championships and national series competitions in previous years. The town of Lourdes lies in the southwest corner of France, part of the foothills of the Pyrenees mountain range. While the town has only 15,000 residents, it attracts some 5 million visitors on an annual basis, visiting on pilgrimages to the Sanctuary of Our Lady, where the Virgin Mary is said to have appeared and miraculous healings from the waters have taken place. The 2000 metre track begins at 900 metres of elevation, losing over half of its altitude (477 metres) over the run, for an average grade of nearly 24%. Riders and spectators ride a funicular tram from the base to the start, with the course zig zagging through tunnels under the tram on the way down. The course is rough, rocky, rooty and, mostly likely, wet and slippery. From the start house riders immediately face a series of sharp turns and rocky, open terrain. From there, the course becomes fast and flowy, dropping in and out of lightly wooded sections dotted with roots and a couple of gap jumps. After this slight recovery, riders hit the final extremely steep rock-strewn portion of the run before a final jump into the finish bowl. This is not a pedalling course, but one that requires tremendous technical skills and the ability to resist losing speed by touching the brakes. Any mistake is likely to have a huge impact on run time. In the women's field, all of the top riders are entered, with reigning World Cup champion and world champion Manon Carpenter (Madison Saracen) sporting the Number 1 plate after her breakthrough season last year. She is expected to resume last year's battle with countrywoman and former World Cup champion Rachel Atherton (GT Factory). Others expected to be in the fight for podium spots are Emmeline Ragot (MS Mondraker), who could receive a huge boost from riding on home soil, as well other French riders such as Myriam Nicole (Commencal/Vallnord) and Morgane Charre (Solid-Reverse). There is only one Canadian woman in the field - Casey Brown (Bergamont Hayes). Brown finished 11th overall last year, and will be looking to improve upon that as she chases her first World Cup podium. The men's field will see 2014 World Cup champion Josh Bryceland (Great Britain) with the Number 1 plate. This will be a chance to see if Bryceland is fully recovered from the serious foot injury he suffered at the world championships last Fall. Others sure to be in the mix are former multi-time World Cup champion Aaron Gwin (Specialized Racing), world champion Gee Atherton (GT Factory), Troy Brosnan (Specialized Racing), Sam Hill (Chain Reaction Cycles/Paypal) and former champion Greg Minnaar (South Africa), who is coming back from a hand injury. The big French hope will be Loïc Bruni (Lapierre Gravity Republic). 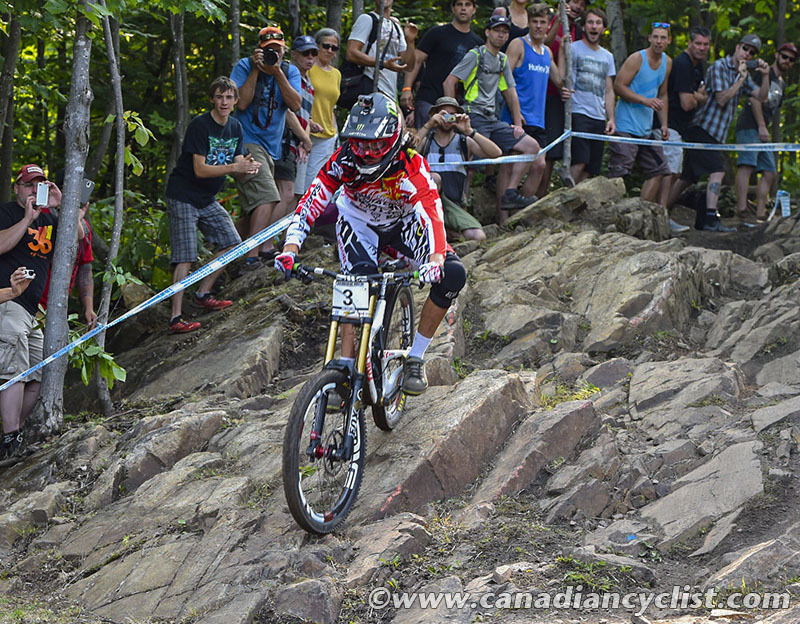 Canada's biggest downhill star, Steve Smith (Devinci Global Racing) will miss Lourdes with a foot injury. According to the team, "It is with great disappointment that DGR announces that Steve Smith will sit out the first round of the 2015 UCI World Cup. Due to an unrelated injury [not related to last season's injury] to his navicular bone in his foot Steve has been sidelined for recent weeks. We approached the injury with great optimism that he would be fit to return at round #1 in Lourdes, France. These hopes have fallen short, and Steve will have to wait." There will be one Canadian Junior man - Magnus Manson (Norco Factory) - and three Elite men - Mark Wallace (Devinci Global Racing), Forrest Riesco and Jack Iles (Norco Factory). The action begins on Saturday with timed qualifying runs, followed by the World Cup on Sunday. The Junior Men start the racing at 1230h, followed by the Elite Women at 1315h and the Elite Men at 1400h (all times European).